The festival brings together international and local artists, composers and performers from the worlds of classical, experimental, rock, noise, sound art, dance and visual art for two days of exploratory music-making in Glasgow on 5 and 6 May. There’s a Japanese theme to parts of this year’s events, with 80s cult duo Syzygys headlining Saturday night, Osaka-based artist Tetsuya Umeda exploring the acoustics of Glasgow’s City Halls and Old Fruitmarket, and a new work by New York’s Miya Masaoka which uses the koto, a traditional Japanese instrument. Masaoka also collaborates with British sax virtuoso Tony Bevan, just one of several sax performers which include Mats Gustafsson, Dror Feiler, Sue McKenzie and Laura Macdonald. Local performers Acrid Lactations (Susan Fitzpatrick and Stuart Arnot) give a solo set on Sunday and join Joe Posset for his Grand Dictaphone Jaxx, plus a new work from Tina Krekels. There are World Premieres for the BBC SSO from Naomi Pinnock, Evan Johnson and Dror Feiler, and two BBC Commissions from James Clarke and Marc Sabat. Plus the European Premiere of Ashley Fure’s piece Bound To The Bow, named a finalist for the 2017 Pulitzer Prize In Music. 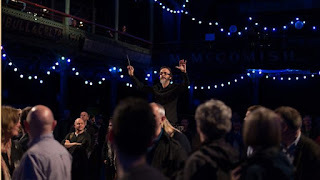 Tectonics Glasgow is once again curated by the BBC SSO’s Principal Guest Conductor Ilan Volkov and by Alasdair Campbell, Director of the Counterflows Festival. Audiences at Tectonics Glasgow can also experience The Burnt Room, a dance work seen in Berlin and Tel Aviv by artists and choreographers Ohad Fishof and Noa Zuk, which features a live soundtrack. Video - Performance in May 2012 with ondes Martenot, ondea and visual arts (sculptures, photography and sound installation in situ), Paris. This short video features extracts of Judith Ring's composition for onde and tape, Flux jeux de bague (premiere). Ondist: Nathalie Forget. Sculptures, sound installation, photography: Nathalie & Henry-Pierre Forget, Mathieu P.